For the district, see Khanewal District. For other uses, see Khanewal (disambiguation). 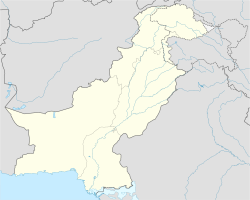 Khanewal (Punjabi and Urdu: خانیوال‎) is a city and the capital of Khanewal District in the Punjab province of Pakistan. It is the host city to the second largest railway station in Pakistan. Historically Khanewal is a relatively modern city having its earliest foundations laid by the British Empire owing to its importance as a railway junction. The city was a junction of the Khanewal–Wazirabad railway line and provided a connection to the city of Karachi via Lahore. ^ Punjab – Imperial Gazetteer of India, v. 20, p. 324. This page was last edited on 6 April 2019, at 10:47 (UTC).